Integration of CFturbo and PumpLinx/Simerics-MP. On 24th October 2013 Simerics and CFturbo signed an agreement to develop and maintain interfaces between the Turbo-Machinery design software CFturbo and the Simerics virtual testing CFD tools PumpLinx and Simerics-MP. Since then there have been many enhancements to both software systems and the integration between them has just got better and better. From Design point to 3D model to CFD simulation in a few minutes! 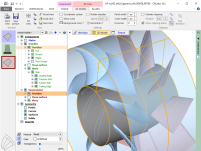 CFturbo is a modern, powerful software for interactive design of turbo-machinery. It’s easy to use and enables the designer to either start from scratch or redesign existing geometries. 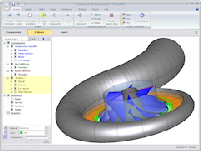 Design Fans, Blowers, Pumps, Compressors, Turbines, Ventilators Volutes & Stators using established rules or adapt to suit your own empirical and experimental data. PumpLinx and Simerics-MP provide unsurpassed speed, accuracy, and numerical strength in simulating the heat transfer and fluid dynamics of complex systems. PumpLinx focuses on fluid pumps, motors, valves, compressors, and cavitation. Simerics-MP offers the same core strengths (e.g., automated meshing, speed, accuracy and physical models) for multi-purpose applications. PumpLinx and Simerics-MP set-up and simulation times are typically an order of magnitude faster than other options on the market with no compromise in accuracy. The predictions consistently match physical hardware test results within experimental error. CFturbo GmbH, with its headquarters in Dresden, was founded in 2008 as a spin-off from the CFDnetwork Engineering, a successful CFD consulting company since 1993 offering the most powerful and user-friendly interactive turbo-machinery design platform on the market. 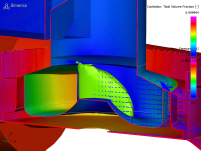 Simultaneously using the software CFturbo in combination with commercial CAE software for ambitious consulting projects in the field of design and optimization of turbo-machinery.